We had a really exciting event take place on the designer floor last week! It was the World of Valentino Trunk Show and it was so amazing. Every Valentino sample we had for pre- fall was literally like a work of art. The event was so much fun and I'm glad I was still here to be able to attend. About a week before the event our team had started calling our customers to let them know about the event, and to set up appointments with them. We had a really good turn out, and even people who hadn't been called were coming to the third floor to see what was going on. There was a dj playing music and the event was catered with drinks and hors d'oeuvres for our customers as well. 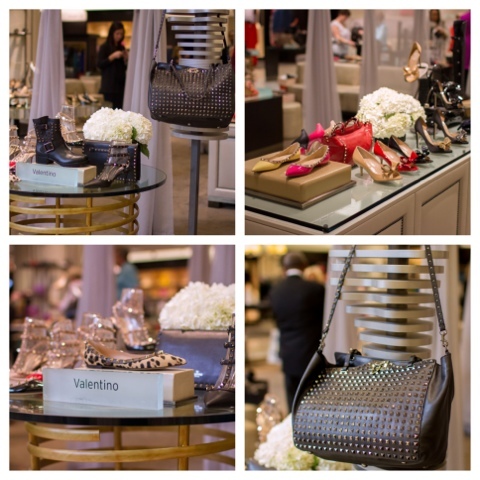 A rep from Valentino was there to help any customers who wanted to know more or to be personally styled. There were pre-fall samples in Valentino shoes, clothes, and handbags. There was also models walking around during the whole event. Everything was so beautiful! The trunk show was a success! Not only did we meet our goal for that day, but we also exceeded it, which is always exciting! I know the customers really enjoyed their time just by how well they responded to the event. It isn't everyday that you get to attend something so neat. I mean I know I was super excited to be there! It was a really great experience, and something I could never get tired of! Valentino honestly designs such beautiful and creative pieces that you could just look at all day! I was definitely in awe by everything.